Hey Coffeeholics! How was your weekend? I had a blast! After a long time, I was finally able to go to another event. But I will share about that in a different post. This post is a bit personal coz I just wanted to show off (hahaha show off talaga!) my brand new metallic tumbler that I bought at STARBUCKS! 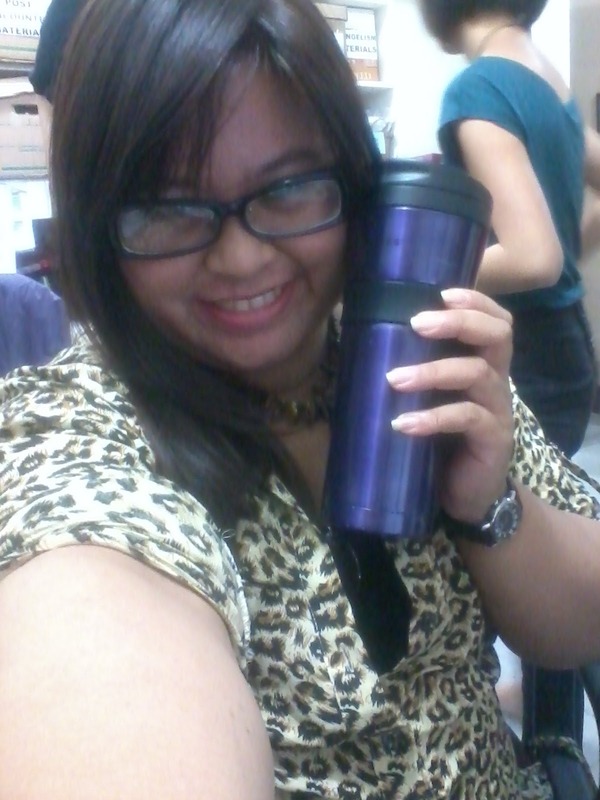 Meet my new baby, my Starbucks Vivi (vivi as in violet.. hahaha!). Yes, I name inanimate objects. And yes, I call my tumblers my babies. Hahaha! I'm a big fan of coffee-related things (ay obvious ba?) and well most of my mugs and tumblers came from Starbucks. Vivi is my brand new addition to my Coffeeholic Collection! When I saw this at the Starbucks shelves, I swore that I will buy it! It's so rare that Starbucks will sell a violet/purple tumbler. Plus its a metallic one! (I don't buy plastic tumblers anymore coz it never lasts around me.. it usually ends up with a crack in 1-2 months time.. so I invest in metallic tumblers instead.) You can ask any of my friends.. I swear I visit Starbucks Gateway EVERYDAY to check on those violet tumblers -- to see if it was still available! (parang nursery visit lang ah! )I couldn't buy it yet coz it wasn't on my budget coz I still had a functional Starbucks metallic tumbler but not as pretty as this one. Since it was a "WANT" and not a "NEED" on my budget, I couldn't justify myself in buying it. I swore that I will buy it once I get my hands on "extra" money. So I wished and prayed and forced myself to not buy it yet but wait for the blessing to come. And I'm happy to say that the money came! Some came from my dad (he gave me some Starbucks GC for Christmas) and from the money I got because of my writing projects on Odesk. I was able to withdraw my money from my ODESK earnings and it arrived last week. So I was pretty happy coz I now felt justified that I could buy my Starbucks tumbler. Yay! So yeah, I bought Vivi also as a remembrance that WRITING is not only FUN but is also FINANCIALLY REWARDING! I remember that when I was in high school, I hated writing soooo much. I found it mind draining and stressful. Haha. I remember even swearing that I'd rather READ than WRITE. But what I didn't know was because I read a lot, the writing part came naturally. And so voila! I never thought I'd earn through writing but here I am.